Mother’s Day is this Sunday, and if you’re a mom, what’s in it for you? I don’t have the luxury of spending Mother’s Day with my kids, enjoying their pampering and attentions; in my world, that’s a sentimental notion. But this is a holiday set aside just for us mothers, so if plans aren’t made for us, let’s make some for ourselves. I choose Mother’s Day to be a day I get to think about myself; perhaps indulging in a massage, or spending a moment reassessing my health and considering ways of integrating more tasteful nutrition, for example, into my diet. I know, as most of you, what I’m supposed, or rather not supposed to eat. You can’t get through a day without being buried under the rubble of conflicting dietary information. Big Brother, especially, likes to give his opinion of what he thinks I should be eating, even informing me how I should dress. Everyday pop-ups appear on my screen referring me to weight-loss and plus-size sites, having profiled me according to my search engine data. Still, my body screams at wretched excess, barking back if the scales tip too much in a positive (aka, negative) direction. Moreover, I feel lethargic, losing my mojo; I just feel blah. So I always return to meals such as the following for everyday eating.These types of recipes are my panacea, and leave me feeling healthy and energetic. I’m not suffering when the end result tastes as delicious as the one I’ve penned below. I’m a fan of sushi, and love the flavors of Japanese cuisine in general, so often use vinaigrettes heavy on the ginger and wasabi, as I did in this recipe. Edamame is also a favorite, which, according to WebMD , “…is a star legume”, packed with fiber, protein and a host of vitamins and minerals. I tossed quinoa into the salad for good measure. Many consider quinoa to be a grain, but actually it’s a grain-like crop known for its edible seeds. And, like edamame, it’s a nutritional powerhouse. Whole-grain quinoa contains more protein than any grain, and the protein supplied includes all nine essential amino acids. OK, enough of the health jargon. Just leave it at this: this salad is as delicious as it is healthy. I may decide to conclude my Mother’s Day meal with something decadent and rich, and readily admit to indulging my fondness for fat and fried foods with the best of them. Butter is not my enemy; it’s a close friend, that itty bitty bit working so hard to make a meal taste good. Who else is willing to work that hard to please? I’ve exercised my entire life battling the aftermath of carbonaras and creamy clam chowders — so what if some of it shows? What’s more stunning than a Ruben’s Renaissance woman — meta-mother of the universe — with her fresh-milk complexion; a women who is brilliantly, beautifully plump, in a generous-spirited way. This Sunday, chocolate cake is on the house: Happy Mother’s Day! Note: This salad may be made up to 8 hours, refrigerated, in advance, reserving greens to stir in at the last minute before serving. Cook quinoa according to package instructions, and cool. Make a vinaigrette by whisking 1/2 teaspoon of wasabi powder into soy sauce and vinegar, adding additional wasabi to taste. Whisk in oil, ginger and garlic. 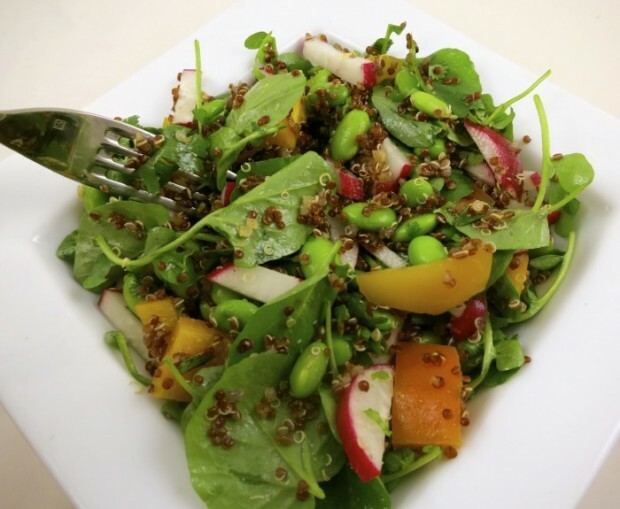 Stir cilantro, mint, edamame, radishes, pepper, greens and quinoa into dressing and serve. More Recipes Filed Under "Dinner salads"